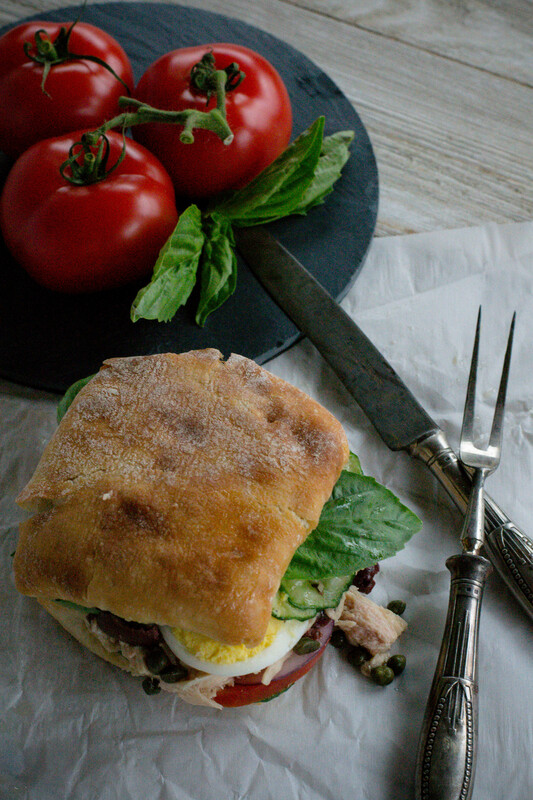 Tuna Pan Bagnat - What the Forks for Dinner? So you have a can of tuna…..you need lunch, or a light supper….. Tuna Pan Bagnat. 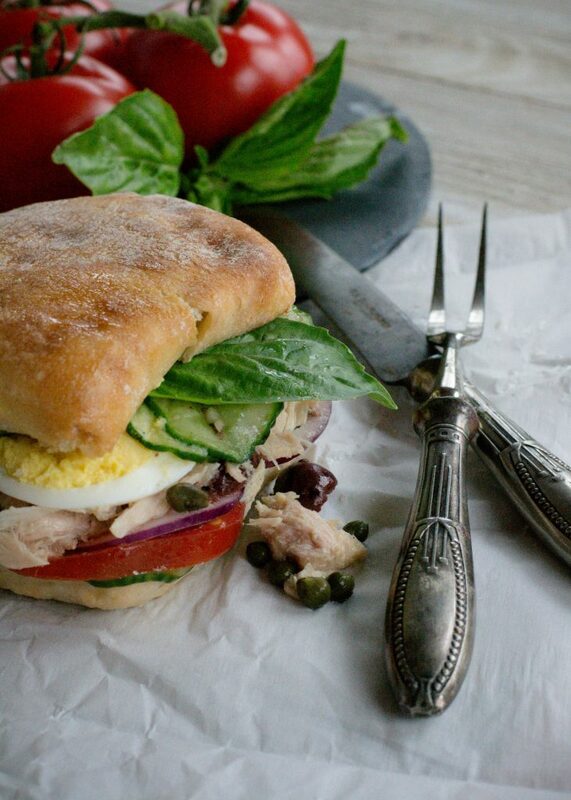 Pan Bagnat (pan ban-Yah) wet or bathed bread, is a specialty of the Provence region of France. 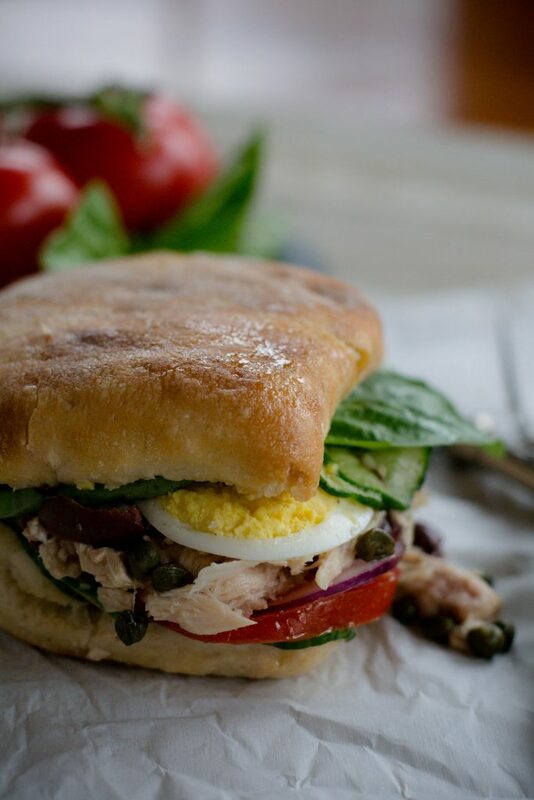 Traditionally a round wheat bread is stuffed with the classic Salad Nicoise ingredients…. tuna, anchovies, tomatoes, eggs, olives, red onions, capers, garlic and olive oil. Crusty bread, in this case my fav ciabatta, soaks up a yummy vinaigrette made from anchovies, garlic, dijon, balsamic, and olive oil. Use the best olive oil you can, especially when making a vinaigrette. For extra crunch, I tossed thinly sliced english cucumber slices into the vinaigrette and let them soak up the flavor while I prepared the rest of the sandwich. 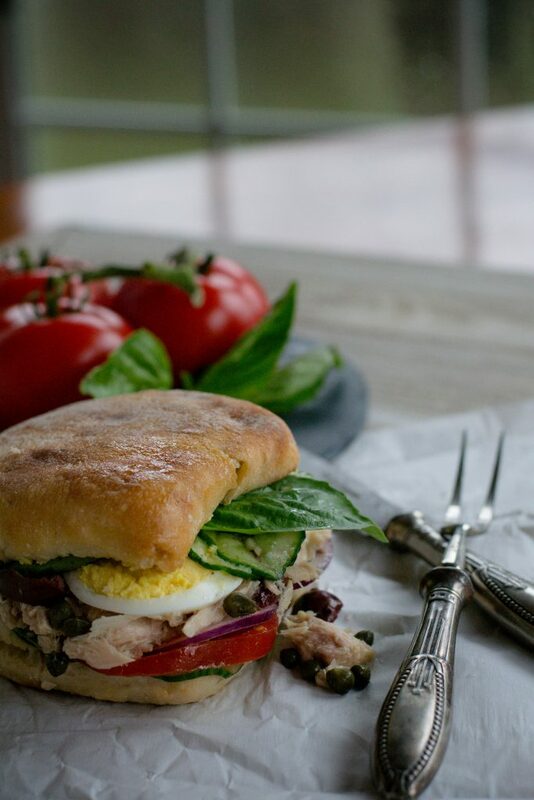 Tuna Pan Bagnat is easy to make, portable, and can be made ahead. In fact, the longer it sets the better it gets. Perfect for a picnic, or make one on a french baguette, and you can have lunch for several days…..if it lasts that long. Admittedly, I am not a huge sandwich fan, Tim on the other hand is. I have no particular reason, but a sandwich is not always my first choice. Perhaps I have been swayed, this truly was delicious! In keeping with tradition, I pressed the sandwich, meaning after I wrapped it,first in parchment paper, then tin foil, I placed two cast iron skillets on top and let it sit. Pressing makes sure all the flavors “bathe” the bread. We pressed our Tuna Pan Bagnat for just a few hours. I can only imagine how good it would be left over night. So, take a trip to the Provence Region of France with Tuna Pan Bagnet…..Bon Appetit! Whisk together the anchovies, garlic, vinegar, mustard, salt and pepper. Slowly drizzle in oil, whisking constantly. Slice cucumber thinly then add to vinaigrette and toss well. In a small bowl gently mix the tuna, olives, and capers, trying not to break up the tuna too much. Spread half the cucumbers on bottom of bread. Top with tomato and onion slices, then with tuna mixture, basil, olives and egg slices. Top egg with remaining cucumbers. Cover with second bread half and firmly press sandwich together. Wrap sandwich tightly in foil, waxed paper or plastic wrap, then place in a plastic bag. 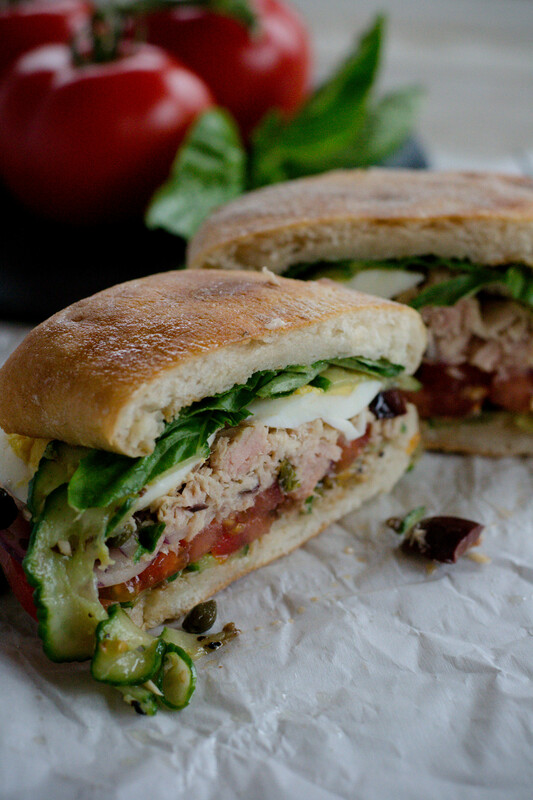 Put sandwich under a weight such as a cast-iron frying pan. Weight sandwich for 7 to 10 minutes, then flip and weight it for another 7 to 10 minutes. Unwrap and serve immediately, or keep it wrapped for up to 8 hours before serving.